Log cabin of N.G. Willard on 80 acres of land. 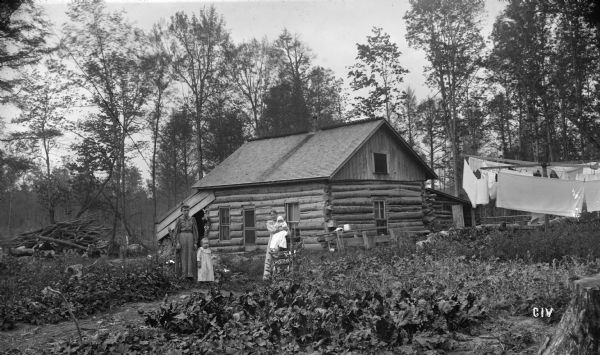 Two women, a young child, and an infant are posing outdoors in the yard. Laundry is hanging on lines on the right. Trees surround the log house. This image is one of many that was created for and appeared on page 17 in "Northern Wisconsin: A Hand-Book for the Homeseeker" (1896), a promotional survey for the Wisconsin College of Agriculture by W.A. Henry. Henry was the Dean of the College of Agriculture at the University of Wisconsin.